The BBC's John Sudworth meets the Chinese entrepreneurs targeting the world's biggest mobile phone market. At some point in the past few months, China's billionth mobile phone customer switched on his or her handset for the first time. The mobile network growth here has been remarkable, with some 80 million new subscribers coming online every year for the past decade. But in some ways the real communications revolution has only just begun. This year, China will overtake America as the world's biggest smartphone market. 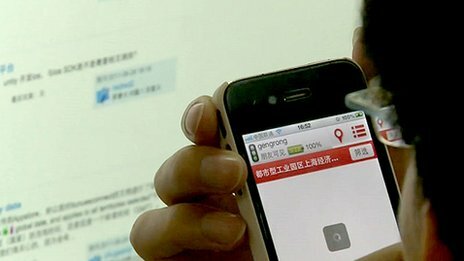 And for many Chinese, the smartphone offers them their first personal route to access the internet - by some estimates 40% of those connecting to the web in China now do so solely via a mobile phone. That offers IT developers, and mobile phone app makers in particular, an extraordinary opportunity. In a small Shanghai office, with a few dozen employees beavering away at their computer screens, Guanxi.me is one startup company joining the gold rush. "There's no better place to be than China," chief executive Alvin Wang tells me. "There'll be an extra 200 million new smartphone users in the next 12 months. We want to be on those phones." The app Alvin is developing allows users to build social networks and then, using geo-location data, track and meet those contacts in the real world. "People are social animals but today's technology is more geared to replacing face-to-face contact. We want to enhance and increase face-to-face contact," Alvin says. Guanxi.me is free to download, and that's important in China. Here, smartphone users are much less likely to pay to download an app than their Western counterparts. 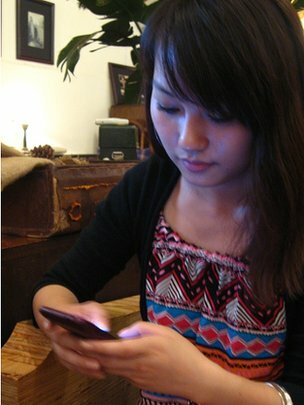 Cheryl Wu is typical of many young smartphone users in China. She has a job in real estate and spends her evenings meeting and socialising with friends; posting, tweeting and messaging her way through her nights out using a series of apps on her smartphone. All of those apps, though, have been downloaded free of charge. She particularly likes the Weishin voicemail app she tells me, because it's fun, convenient and free. So how, then, do you make money as an app developer in China? One way is to try to target "in-app" sales; give away the app for free, get users hooked, and then sell them the chance to enhance their experience for a small fee. It's a model used most successfully by the bigger developers of mobile games technology and the idea is simple. Although users in China may be willing only to pay a few cents for the enhanced service, when you're talking millions of users, that can soon add up to a lot of money. 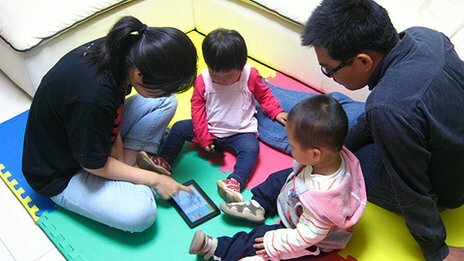 But for non-gaming app developers, advertising revenue is the way forward, and July Cheng, a young mother based in Shanghai, is showing how easy it can be. Her home-made app, developed for her twins, has become a surprise overnight success with tens of thousands of downloads. For each one, July is paid a commission from the pop-up-ads linked to the app, and she now earns more than $1,000 a month this way. "You just need one mobile phone, one PC and your good ideas," she tells me. The holy grail for app developers, though, may well be finding ways to hitch a ride on China's booming luxury brand sales. Apps like Guanxi.me have valuable social networking databases that could prove very attractive to high street retailers. Couple that with the phone's geo-location data, and suddenly the mobile phone offers advertisers a way to get personalised offers into the hands, or onto the smartphone screens, of customers at the moment they pass by the shop door. This kind of technology is being developed in many markets, of course, but it is in China, with the sheer scale of the mobile market and the country's booming sales of luxury brands, that the opportunities might prove the most attractive. One major challenge remains however, and it's an old one: the country's notoriously weak protection for intellectual property. "Once you start to become successful, your app will be copied," Michael Clendendin from industry analysts Red Tech Advisors tells me. "I've no doubt about that, so the only way for you to survive in China is to try to pre-empt that by partnering with one of the bigger companies that might steal your app." That will need to change if China is really going to unlock the creative potential offered by its ever growing mountain of mobile hardware. Guanxi.me's Alvin Wang thinks it will, in part because Chinese companies will themselves join the chorus of international voices demanding a strengthening of legal protection. "It's going to take a little time, I'm not saying overnight this is going to be the oasis for intellectual property protection," he says. "But over next five to 10 years, there will be an increasing awareness from government, and pressure from Chinese companies themselves, to make sure real innovation is protected." For the first time, China has surpassed the United States to become the world's largest smartphone market by volume. The research firm said that smartphone shipments reached a record 24 million units in China during the third quarter of this year, compared to 23 million units in the United States. China, of course, is already the world's largest country, with a population of 1.3 billion; the United States' population is 313 million. “China’s rapid growth has been driven by an increasing availability of smartphones in retail channels, aggressive subsidizing by operators of high-end models like the Apple iPhone, and an emerging wave of low-cost Android models from local Chinese brands such as ZTE," said Tom Kang, Strategy Analytics director. Indeed, Android phones are coming to dominate much of the world: Another report, from Canalys, said that Google's mobile OS has almost 50 percent of the global smartphone market, dominating in the Asia-Pacific region. While Apple's phone is popular in China, it is not prevalent. "Nokia currently leads China’s smartphone market with 28 percent share, while HTC heads the United States smartphone market with 24 percent share," Kang said. "The relatively slow migration to higher-speed networks in China to date reflects the fact that smartphone penetration is still low — but rising fast," Wireless Intelligence noted at the end of the second quarter of this year. "Smartphones are thought to account for around 10 percent of China's total base, but the exact figure is hard to calculate due to the large number of 'grey market' smart devices in the market. China Mobile, for example, says it already has 5.6 million iPhone users on its network, even though the devices can only currently access the operator's (older) 2G ... network and the device is not retailed by the operator."